Today's sandwich bread, from our local bakery. That's really cool!! Did your kids go for it? 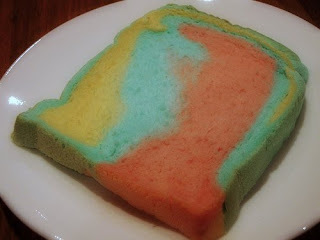 I'd be expecting it to taste like marble cake, and end up bitterly disappointed! A bit like if you made raspberry cordial but used green food colouring. Not sure how I feel about that Liesl! Looks like some funky mould! Can't even begin to imagine what that would taste like with vegemite on it. I LOVE IT! Will freak the kids out and make bread this weekend. SO wrong yet so right, wouldn't you say. That bread looks like wettex to me! I don't think I could eat it. Oh my! How will you see the green fuzzies when they start to appear? er, no thanks. I'll pass on the sandwiches for today. A little bit wrong????? What the h*ck do you put on it?? 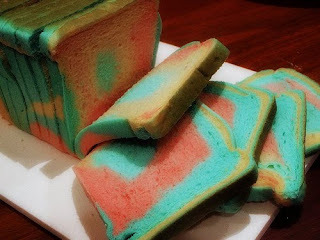 Yum, rainbow bread! It may be a bit wrong, but I love it anyway. We used to make ice cream sandwiches with them! Definitely to be eaten with sprinkles and hundreds and thousands at a children's party - love it. Oh dear, that's more than a little bit wrong. Well, from an adult's point of view anyway! However, I'm thinking it would be a huge hit at a kids party.